Too often, CPR instructors leave their students with the impression that an automated external defibrillator (AED) – a device that shocks the heart during cardiac arrest – is smarter than the rescuer. Think about your last CPR class. The instructor probably just held up the AED and said, "Just put the paddles on and follow the directions. It will tell you what to do." In reality, the AED is a tool that requires you to use it correctly. Believe it or not, it is possible (albeit extremely rare) for an AED to shock someone who is awake. To understand how this can happen, we must understand what the AED is actually doing. Defibrillators don't treat cardiac arrest. Instead, they treat ventricular fibrillation, one form of cardiac arrest. That's why they're called de-fibrillators. There's absolutely no way a patient with ventricular fibrillation could be awake; no blood flowing through the brain makes the patient unconscious. As far as diagnosing ventricular fibrillation, automated external defibrillators are extremely accurate. 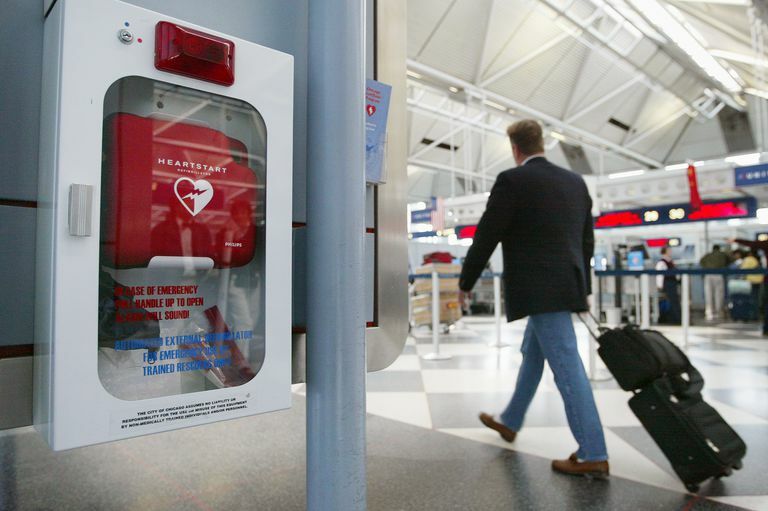 It would stand to reason that if that's all it takes to diagnose a cardiac arrest, an AED on every corner would be way more cost-effective than the number of prehospital providers we have all across the country. Cardiac arrest can also happen from ventricular tachycardia, a condition where the heart beats so fast it doesn't have time to adequately fill with blood. Sometimes during ventricular tachycardia, there is enough blood flowing to keep the patient awake. In that case, instead of unconscious and not breathing, the patient will most likely be weak, pale, very sweaty and may be confused. The treatment for ventricular tachycardia is the same as ventricular fibrillation: a giant shock. Since the treatment is the same, we use the same defibrillator to treat both. An AED is a defibrillator that knows the difference between ventricular tachycardia, ventricular fibrillation, and everything else. It is programmed to recommend shocking ventricular fibrillation and ventricular tachycardia while ignoring everything else. The AED does not know whether the ventricular tachycardia is allowing enough blood flow to keep the patient awake, which would also be enough to keep the patient alive. Hence, it is possible for an AED to recommend shocking an awake patient and it is the job of the rescuer not to. Shocking a conscious patient stops the heart just like it does when the patient is unconscious, and there's no guarantee it will start again. Paramedics and doctors sometimes have to shock awake patients, but we have some important training and tools available in case things don't work out so well. If you have to do CPR and have an AED available, push hard, push fast, and follow the AED's instructions as long as they make sense – but don't shock people who are awake.